This is the official Clock of the Year 2008, certified by the Association of Black Forest Clock (VdS). 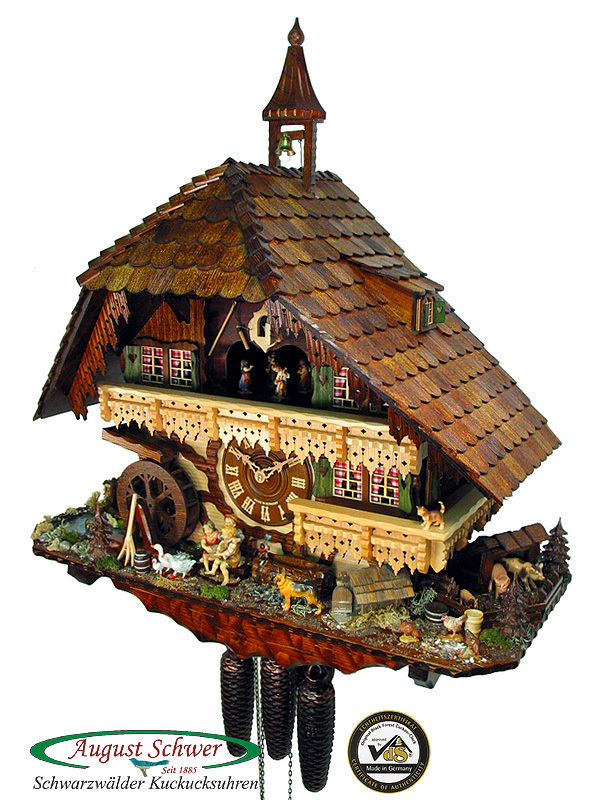 Cuckoo Clock with 8-day movement / running time (mechanical), with music and dancers, turing mill wheel, and swinging fire bell. Each year, the visitors of the Black Forest Museum (Vogtsbauernhöfe in Gutach) choose the most beautiful clock of the year. 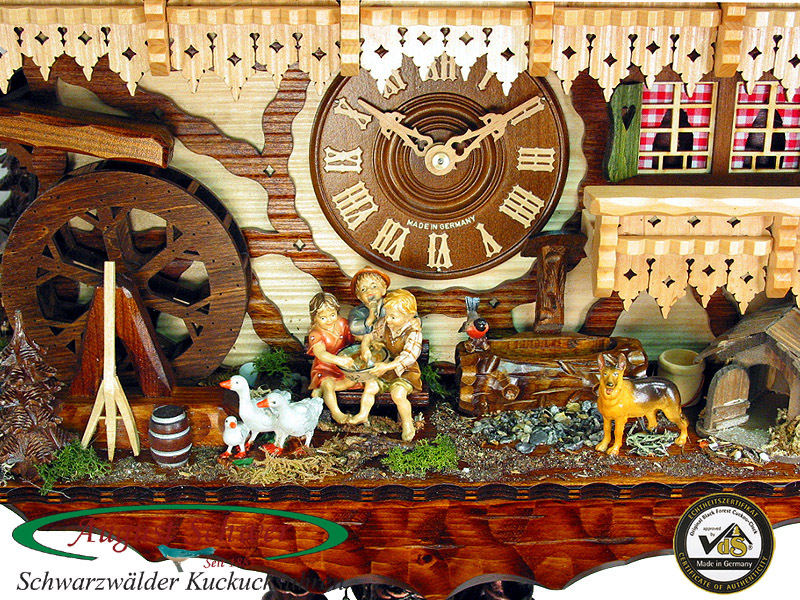 The Clock of the Year award is organized by the Association of the Black Forest clock on an annual basis. All cuckoo clock manufacturers of the Black Forest enter a clock into the competition. The visitors vote for the clock of the year. This is the winner 2008! This very large clock presents every detail, which stands for the uniqueness of a Black Forest Farm house. The clock house itself represents the specific building techniques of the Black Forest. A typical shingle roof, partial timber frame building; a fitted mill wheel, which turns when the clock strikes. Black Forest farm steads are often isolated buildings spread thin over the hilly countryside. A characteristic of such a farm house is the bell tower with the fire bell on the roof. In the case of an emergency, help could be called with these bells. A similar function has the little pond to the left of the clock. It is symbolic of the fire water ponds, which can be found in the vicinity of every Black Forest farm. All these details, at first glance beautiful adornments, have vital functions for a Black Forest farm house. In integral part of farm life are the animals. Farm animals like cows, swine, chicken, geese, today s pets, a dog, a cat, all are present on this clock. Even some wild animals like a duck and a little bird can be found on the clock. This clock has an incredible richness in details, there is always something new to discover. The central element of the decoration is the children figurine, with three little kids sitting on a bench. All figurines and decorative elements are made of wood and are hand-painted. The dancing figurines are high quality children musicians, each a different figurine with a different musical instrument. All parts made of wood, wooden dial, hands, cuckoo, pendulum. August Schwer exclusive life-like cuckoo! Premium Model: 5 years warranty, real cuckoo door hinge, antique-style chains, wooden know on night shut-off, nickel-plated chime spring (long life). This clock is an absolute masterpiece! The size and fascination with detail is very rare, this is a collector s piece and highlight in any house for years. Look at the pictures of the 2008 award ceremony as pdf-file. Simply click this link - it might take some moments to download, the file is fairly large.